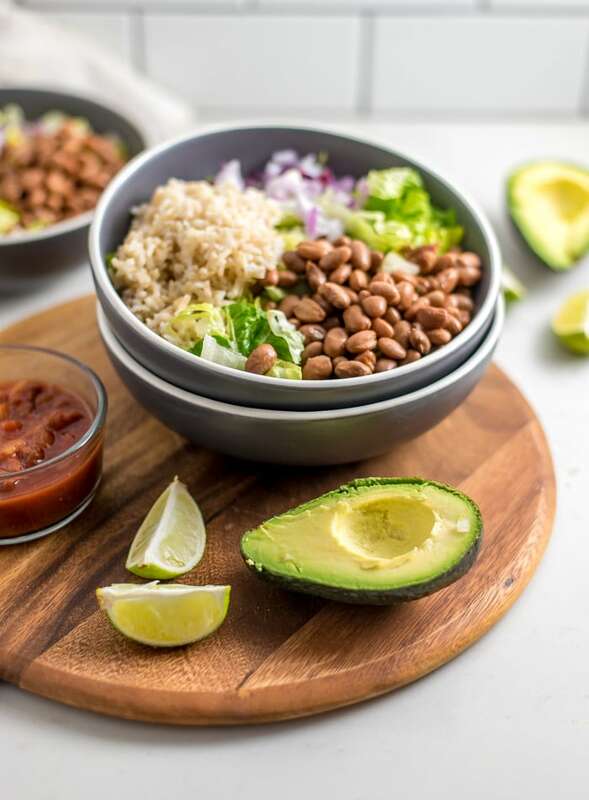 This 6-ingredient brown rice burrito bowl is a very simple vegan meal you can put together quickly with just a few simple ingredients. 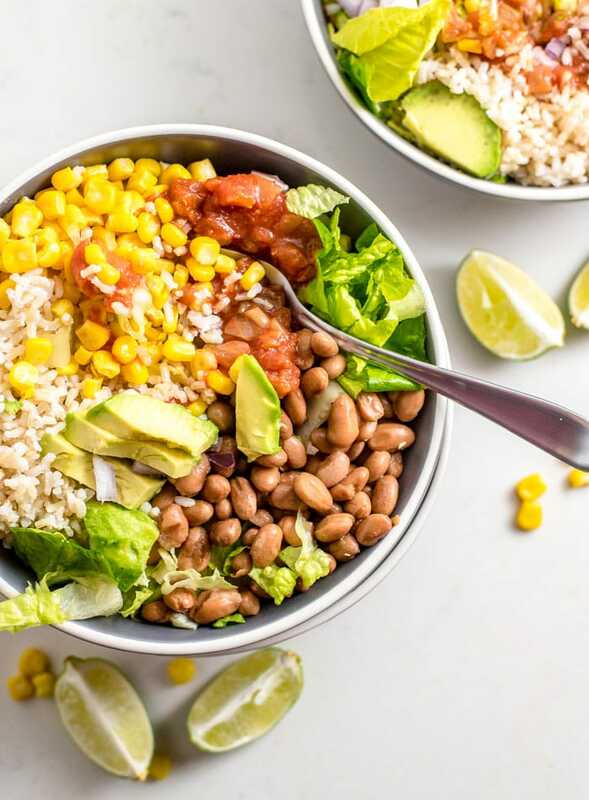 You’ll need romaine lettuce, corn, pinto beans, brown rice, salsa and avocado. This brown rice bowl is part of my 6-ingredients or less series, so you’ll need…you guessed it, 6-ingredients to make it. Let’s take a look. Pinto Beans. 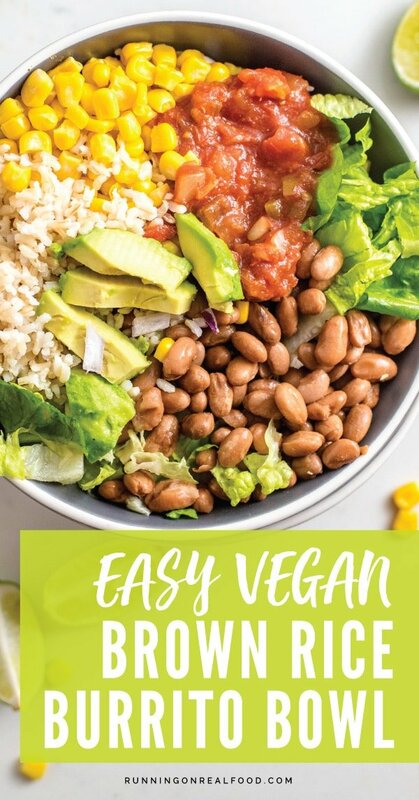 I used canned organic pinto beans in this recipe. 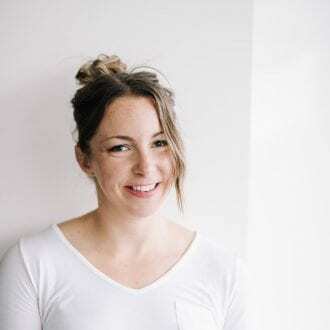 Beans such as pinto beans are high in fibre, provide protein, B vitamins, can help reduce blood sugar, improve cholesterol and help maintain a healthy gut. As an alternative to pinto beans, you can use black beans or kidney beans in this recipe. Brown Rice. I usually cook a batch of brown rice as part of my weekly meal prep but for this recipe I use quick cooking brown rice so it took just 10 minutes. As an alternative to brown rice, you can use quinoa, farro, freekeh, white rice or wild rice in this recipe. Whole grains such as brown rice are a source of B vitamins, iron, magnesium and selenium. Romaine Lettuce. 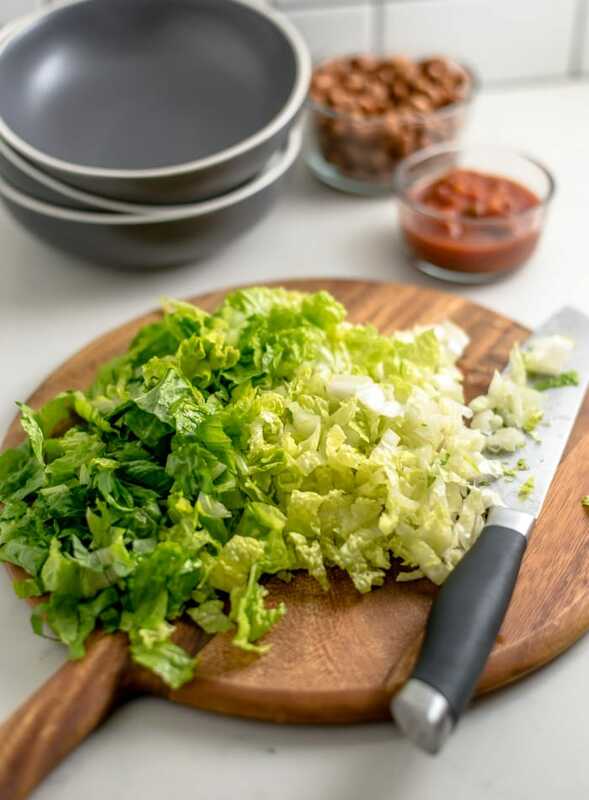 To give this dish plenty of volume and add extra fibre and nutrition, I used shredded romaine lettuce. I like the crunch romaine adds but you could use spinach or another lettuce as an alternative. Avocado. Avocado is a must-have. Healthy fats, fibre, vitamins and minerals, plus…it’s avocado. Salsa. To keep things simple, use your favourite store-bought salsa to top your burrito bowl. Corn. 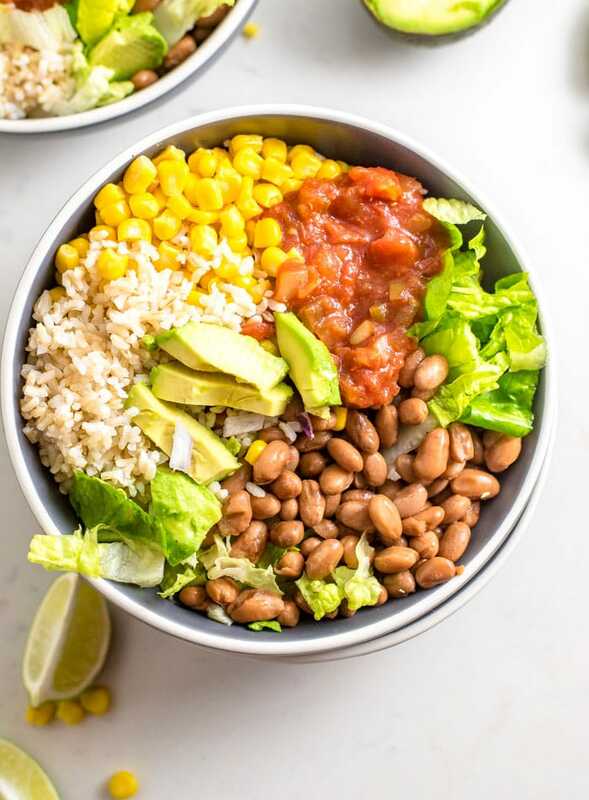 I love the sweetness of corn mixed in with the beans, rice, salsa and avocado. You can use fresh, frozen or canned corn. The only other ingredients I added to mine were some diced red onion and a spritz of fresh lime juice. To make this in advance, I’d suggest prepping the individual ingredients and assembling as needed throughout the week. You can pack up your lunch for the next day no problem, it will keep well assembled for 1-2 days. I just wouldn’t go longer than that as the romaine will get soggy and avocado will brown. 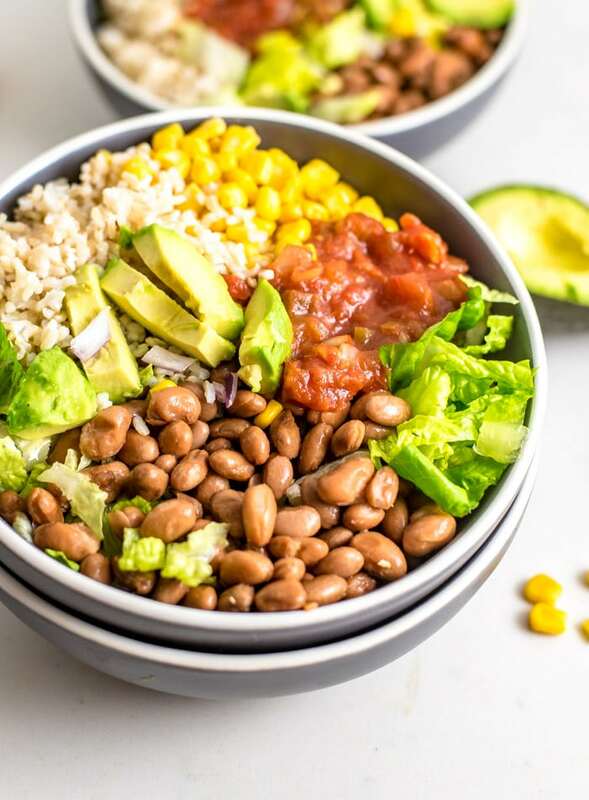 These 6-ingredient burrito bowls are so easy to make and make a great dinner any night of the week. They’re high in fibre and protein, filling, healthy and delicious. Total recipe time does not include cooking brown rice. I used quick cooking brown rice which takes 10 minutes, otherwise you’ll need 45 minutes to cook brown rice.